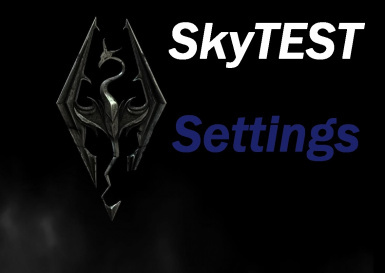 SkyTEST Settings is a simple mod that tweaks and also adds new stuff. Do what you want with the file, as long as you credit. * The mod is now dependant of Survival Mode. * Fooditems are now supported to fill hunger. * Heartfire DLC Related Interior Homes has been set as "NoResetZone" to prevent Reset/Respawn. * Edited Followers Follow Radius to stop them from pushing Player. * Added Recipe for Baked Potatoes in CookingPot. * Added Recipe for Grilled Leeks in CookingPot. * Added Recipe for HoneyNutTreat in Heartfire Oven. * Added Recipe for TaffyLongTreat in Heartfire Oven. * Moved Recipe for ApplePie over to HeartFire Oven. * Moved Recipe for Bread over to Heartfire Oven. * Moved Recipe for SweetRoll over to Heartfire Oven. * Removed SkyTEST version of ApplePie Recipe. * Removed SkyTEST version of SweetRoll Recipe. * Removed SkyTEST version of Bread Recipe. * Greatly Reduced all Tree's Wind Movement Speed. * Now is 100% Chance of a Kill Move on last enemy within a group. * Barrels will no longer be Havok Enabled but still Breakable. Dear Nexus Moderators, if i am somehow breaking a rule, please give me a warning or send me a PM instead of just instant ban, i am always willing to correct humbly any wrong doing. Many thanks to everyone who has Endorsed, Voted, Giften Steam Games or given small Donations, who ever you guys are, thank you all!! This is basically a compilation of many of the most awesome Tweaks of Mods around the Nexus in a single esp. * Mannequins will stay in place. * Allowed a max of 6 arrows attached to actors. * AI Allowed Actors in Combat has been increased from 100. * Actors will now Sandbox also on higher floors. * Actors will now Ragdoll as soon as they die, instead of spinning before death. * Added Craftable Left Hand rings variation of all existing non enchanted Rings, they can also be found as loot. * Player and NPC speed while Sneak, Walk and Run has been tweaked to be a little bit more realistic. * Altars Blessing will last 24 hours instead of 8. * Merchants will have more Gold as the Player levels up. * Dead Bodies by NPC and Creatures should now have Collision. * Increased value of Silver Misc Items. * Increased chances of Actors fleeing when their Health is low. * Increased the Value of Nirnroots to double. * Cells and Actors will respawn every 7 days. * NPC's will only randomly talk to you if you are close enough to them, no more random chat from far. * Magicka Regeneration while ON COMBAT has been doubled. * Force applied when killed by arrows has been reduced, to give it a more realistic feel. * Increased the value of the Animal Pelts and Tusks, so its now worth going out to hunt. * Increased Valude of Gold & Silver Ingots. * Followers will now move away from you if they are blocking your path. * Increase the value of the Troll Skull. * Reduced melee force applied when dead. * Enhanced killmoves, now you will have a 100% chance of doing a kill move ON THE LAST ENEMY WITHING A GROUP. Check the ChangeLog in the "CHANGES" tab. Unrar files inside data folder which is located inside main skyrim folder.